Paul is a seasoned developer with 17 years experience in creative applications and 10 years experience in web programming and team management. 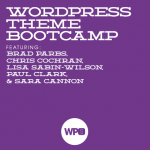 He has built a lot of really cool websites with WordPress, and is a pretty prolific speaker. Recently, he released a plugin named Styles that extends the capability of the WordPress Theme Cusomizer.